through the Channel Islands and down to San Diego, beginning on Thursday May 31. PD: Please give us a bit of details on Prospector, where she originated and past events she has participated in. PM:"This is the second boat we have had in the Prospector program. We are "based" in Newport, Rhode Island and our four Owners: Paul McDowell and Larry Landry are from Shelter Island, NY, David Siwicki is from Jamestown, RI and Marty Roesch is from Annapolis, MD. Our current boat is a Mills 68 which raced very successfully as Allegre then as Caol Illa before we bought her in Sardinia in 2016. The Prospector team has been ticking off major ocean races and other marquee events for the past four years. So far to name a few of the more prominent ones: the Transatlantic Race, Fastnet Race, Middle Sea Race, Caribbean 600, Voile de St. Barths, Maxi Worlds, Pineapple Cup (Miami to Montego Bay) and Marblehead to Halifax. We have been on the podium in nearly every event and set the course record last summer in the Marblehead to Halifax Race. 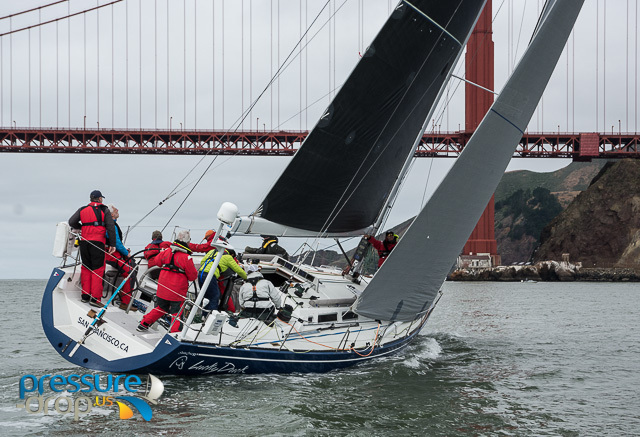 So far in our California campaign, we have done the Islands Race and the San Diego to Puerto Vallarta Race and were fortunate to make the podium in each one." PD:How did the Shelter Island Transatlantic Partners come to be? PM: "A group of us from the Shelter Island Yacht Club formed a partnership to compete in the 2015 Transatlantic Race and didn't have enough sense to stop after that." shape during this mini marathon? PM: "The logistics for us are daunting given the large crew, shore team, assorted spouses and friends with all of us from the East Coast. Add in that Prospector is too deep to get into some of the harbors makes for a lot of organization and headache for our boat captain, Tery Glackin. We do bring our own Chef along which makes it easier to feed the hordes and keeps the boys out of the bars! It's all fun though which is the whole point and I am sure we will persevere and enjoy the terrific California hospitality we have seen so far." PD: The crew list shows 18 bodies, assuming you will be rotating people in and out, what does the program project for numbers on board for any given leg? PM: "We will actually sail with 18. Prospector is a lot of boat to handle and given her narrow beam, the extra weight on the rail comes in handy. On maneuvers everyone is busy." PD: "Any of the legs stand out as most anticipated?" PM: "We are looking forward to all of them. We haven't sailed the event in the past so that's a bit hard to say. It will be fun to sail out of San Francisco Bay and under the Golden Gate." PD: If not to much trouble, can you name some of the key players on board and positions? Tery Glackin - Boat Captain/Crew Boss"
PD: You have owned Hana Ho for some time, can you provide a bit of insight on when you got her and some of you favorite races on her? 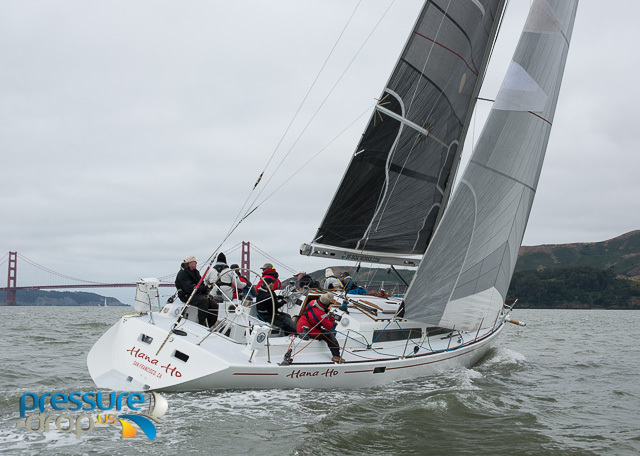 MD"Actually I've been racing on Hana Ho since Rolfe and Julie Croker brought her to the bay area in the 80's...we did lots of races on her, including a couple of Transpac's and many Mexico races as well. Rolfe and Julie turned her into a fast cruising boat, installing an owner's stateroom in the bow, and lots and lots of great cruising gear...and we did the Baja HaHa in her as well, among our best times on the boat! I sailed a lot of miles with Rolfe and Julie over the years, and I'm lucky to have Julie as my 'boat partner' to this day." PD: You have done some mods to here in recent times and she looks better than ever! What have you improved on in those mods? MD "Since about 2010 or so we've been on a constant upgrade path...first we removed the cruising interior and gear, removing about 5000 lbs from the boat, in preparation for PacCup in 2012, and over the years we've pretty much rebuilt and modernized everything except the keel...new rudder, new rig, etc. In the last year or so, the boat got a paint job and we removed some more weight, lengthened the poles and optimized around larger spinnakers. She looks pretty good for a boat built in 1980!!" PD: You have been doing a lot of offshore lately, what's left on the schedule for 2018? MD: "We did the PV race in March, some local OYRA races up here, and we're headed south on the CORW. Then Long Beach Race week (looks like we'll have a strong fleet of Santa Cruz 50s and 52s, which should make for great racing. Then back to the bay area for the second half of the OYRA season as well." MD: This is your 1st CORW, what are your expectations and hopes? 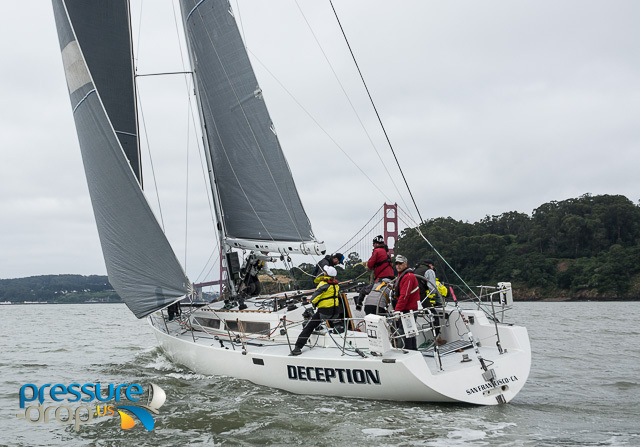 MD: "Well...most of the core group has done a whole lot of Spinnaker Cup and Coastal Cup races together, on Hana Ho and on my previous boat, and Express 37, so I guess you'd say we're hoping for the 'usual conditions' - wild and crazy crash and burn down the coast! The Southern California races are new to us and should be interesting. We did Santa Barbara to King Harbor last year in Hana Ho and had fun, so we're looking forward to the SoCal 300 (Santa Barbara to San Diego). There is a nice resurgence of SC 50's and 52's...we're just hoping we can hang in there with perennial favorites Horizon (SC50) and Lucky Duck (SC52) among others." PD Can you provide some insight on the crew going with you, their positions and stellar qualities? MD: "What is it they say about Old Age and Treachery?? We have a great bunch of people that have sailed together for years...in fact our average age on the boat in the last PV race was nearly 60...but we have some younger folks too. Among the team are regulars that have done multiple PacCups and Mexico races on the boat, including Craig Page, John Kernot, Chris Chapman, Jason Bright, Mike Maloney and Mike Reed, and we'll be joined by some of our friends from outside the bay area in the southern california races, including Kim Stuart and Rob Waterman. Stellar qualities they possess primarily is to be able to drive in a big blow!" she was optimized a number of years ago, can you provide some insight into that extra gear she possesses? LB: "Your question makes it sound easy and it is anything but that. I am sure you noticed Lucky Duck did win the overall last year. That extra gear you mentioned comes from a number of different variables and hard work. If I was going to only talk about one reason it would have to be the bottom of the boat and Dennis Choate's team provides us with the best racing bottom available." PD: CORW packs a lot into 8 days, What steps is Horizon taking to keep the crewe and boat on top of their performance levels? LB: The CORW is a logistic nightmare and it is also the best race I have ever competed in. Over the last two years, our offshore skills have never been put to the test like this series provides. Last years run from Monterey to San Santa Barbara was the most memorable race that I have ever sailed in, with the winds reaching close to 40 knots and the sea state producing some of the biggest waves I have ever seen we hit a new boats speed record of 28.8 with Max Moosmann at the helm. I am sure many of your readers know Moosman and he is the only one I know who could see over the top of all the water that was rushing over the top of the boat at that time. Our crew are all Corinthian sailors and return because Horizon is such a dream to sail. I have to give a shout out to Team Shampain for making Horizon what she is today! I also learned a lot from Stan Gibbs, who was our skipper the year we won the CORW overall, blend Shampain and Gibbs together and BAM! That's a winning combination. LB: "This years crew is very strong again. 1. Doug Carey who came from the TP 52 Spookie program. He takes care of the boat and is our bowman. Carey has played a major role in our success over the last two years. 2. Alex Steel came from Team Bolt and would not surprise me if Steel becomes a world-class navigator after next years Trans Pac. Steel, of course, is the team's navigator. 3. Craig Chamberlain has been a "go-to guy" for me for years. He is one of the best sailors I have ever sailed with and is always receiving invites from the bigger boats. Yet he keeps calling me up for and asking what races we are doing this season. I think it has something to do with our rudder? 4. Tom Okeefe came with the boat when we purchased her and is invaluable to the boats success after all these years. We are losing Okeefe to the TP 52 Destroyer next season, but that will not keep me from calling him and asking if he want's to return home. 5. Grant "Spuds" Wooden. I was reintroduced to Spuds through Gibbs and he sailed with us when we won the overall and has agreed to sail with us this year. Like Chamberlain, he is a very good trimmer and helmsmen. 7. Seth Morrel: Morrel goes way back and with Spuds used to run the UK sails loft in Newport Beach. Morrel and I have sailed a Big Boats Series together and many club races together, we are flying him in from back east as a helmsman and navigator for the 300. I just have this feeling that he will be a perfect fit for our team and we will be seeing a lot of him once he gets his hand on the wheel of Horizon. 1. Gary Keith: Keith is one of the hardest workers I have ever sailed with and comes from our J109 program. 2. Jeff Keenan: Keenan is also from our J 109 program and always bust his but. 3. Kat Dippel: Has just joined our team and one of the most naturally talented sailors I have ever met. She works hard and is a very strong helmsman. 4. Max Brennan: I have been watching Brennan for the last two years in the Junior programs and at the Sea Scotts. The kid sails more than I do and his passion for the sport is contagious. The force is with this young man!" PD: 3 wildly different legs in CORW, Does one of them stand out as your favorite and why? LB:We have only done this series the last two years and I do not have a favorite yet. One thing is for certain one of the legs is going to put us to the test and that one will be my favorite. PD: Bill, this is your 3rd CORW, what is it that motivates you for this regatta? BH: "We love the Race Week, it offers a wide variety of sailing with some exciting heavy air usually mixed in. You get to visit some really nice harbors, like Monterey and Santa Barbara thing usually get warmer as you move down the coast!" PD: The 50-52 Class is strong on the West Coast, Your thoughts? BH: "We usually have 5-6 boats minimum on the offshore events, and the boats are all rated very close. Always great competition and it keeps things interesting! " PD: Your favorite leg during the Race Week? BH: "We like them all, but we do hope the Coastal Cup is a bit tamer than last year when we saw 40 knots on the course! 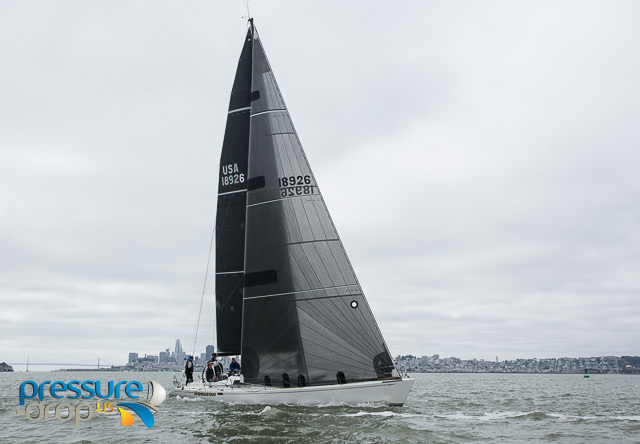 The SoCal 300 stands out because it is broken down in to 3 scoring legs, starts out in light air and takes you through the Channel Islands, which is some of the nicest sailing on the West Coast!" PD: Logistics, how do you prepare? BH: "You know anyone that wants to drive some delivery sails to SBYC for us? The biggest hurdle for us seems to be getting the return sails down the coast, otherwise, we stay pretty compact, with many sleeping on the boat and a few will opt for hotels nearby, which reminds me, I need to make some reservations today!" PD: Horizon is seemingly always atop the podium in the class, what will it take to beat them, or is that even possible? BH: "They are a very well sailed, and well put together boat. Tough to beat. 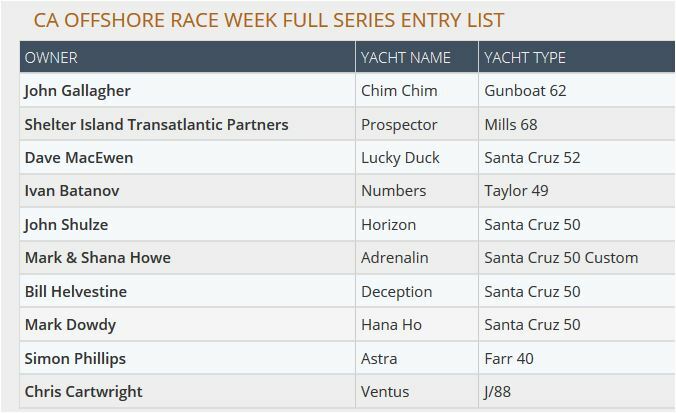 That being said, Lucky Duck was right behind them in the Vallarta Race earlier this year, but somehow they slipped away at Cabo. We will be there, nipping at their heels and hoping for the best!" PD: You have been putting some miles on Lucky Duck in the past couple years! Can you please provide a readers digest short attention span version of recent offshore events? DM:"We have been putting some miles beneath the keel. So far this year, we have participated in the Islands Race, the San Diego to Puerto Vallarta race and the Newport to Ensenada Race. All great events that we have enjoyed immensely. Lots more to come. " PD: This will be your 3rd CORW, what is it that keeps you coming back? 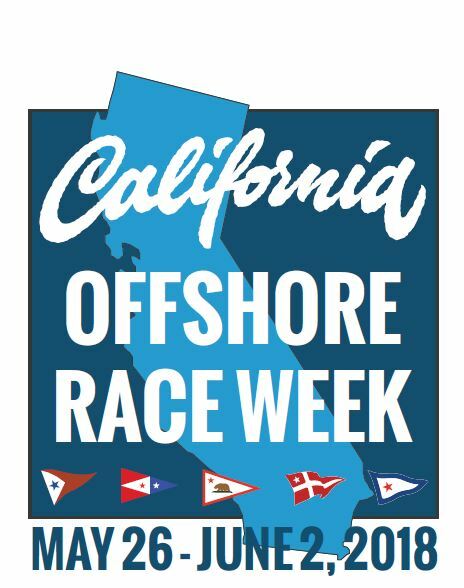 DM:"The California Offshore Race Week was formed by combining three terrific races into one series. Each leg has interesting tactical choices and every race starts and finishes at some of the best yacht clubs on the coast. San Francisco, Monterey, Santa Barbara, San Diego....what’s not to love?" PD: Can you please provide some insight to the crew, their positions and perhaps some of their finer attributes? DM: "The Lucky Duck is fortunate to have a steady crew of amazing sailors. We race offshore with only eight people, meaning that once we are in our watch system, everyone needs to drive, trim, grind and make coffee. Teamwork is essential. " 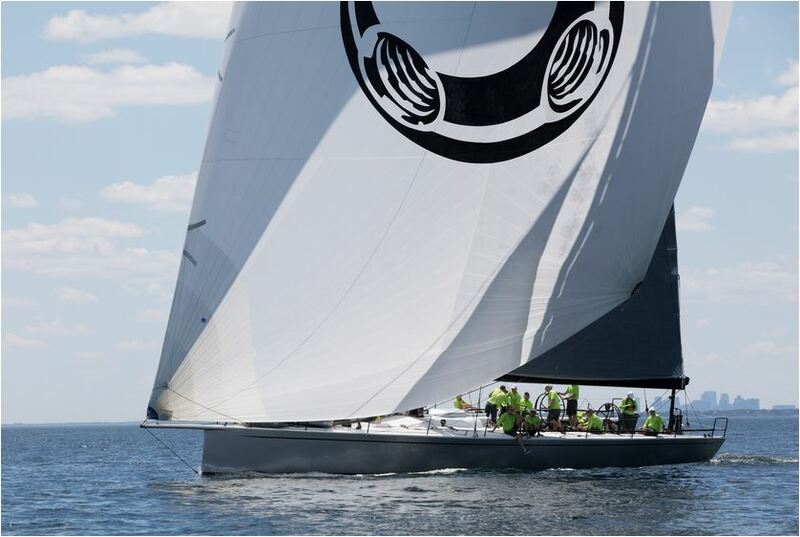 PD The 50's are a very competitive fleet, and Lucky Duck continues to sit atop the podium in most races, yet Horizon seemingly always get the bullets, what makes her so good and what will it take to assume her position? DM: "The Santa Cruz 50/52 fleet continues to thrive. Any of the boats can be competitive on any day. New owners are coming into the class and putting together programs that can clearly win. At the end of the day, good sailing is what it’s about. " is one of them a favorite and why? DM:"They are all good races in their own right. Spinnaker Cup is a bit of a sprint, finishing with a great party at Monterey Peninsula Yacht Club. Coastal Cup is game on with blustery conditions down the coast. And another great party at Santa Barbara Yacht Club (sensing a pattern?). Then SoCal 300 is out to the Channel Islands and into a light air finish in San Diego. I highly recommend the series, but any one of the races is well worth the effort."